I have always loved Mythbusters, right from day one! I took my son to see them in Toronto a few years ago, and I might have been more excited about the show than he was. One of the things that makes the Mythbusters team so appealing is that they stress that failure is not a bad thing; we learn from our mistakes and, as a result, we grow. I learned this lesson well a few weeks ago when I wrote the Azure 70-532: Developing Microsoft Azure Solutions exam. As most of you know, I’ve been working my way through the Microsoft Azure certifications since Christmas. To date, I have completed 70-533: Implementing Microsoft Azure Infrastructure Solutions and 70-534: Architecting Microsoft Azure Solutions. Those were the only 2 of the 3 Azure exams that I had planned to write, as the 3rd exam is a Dev exam, and I can’t program my way out of a box. 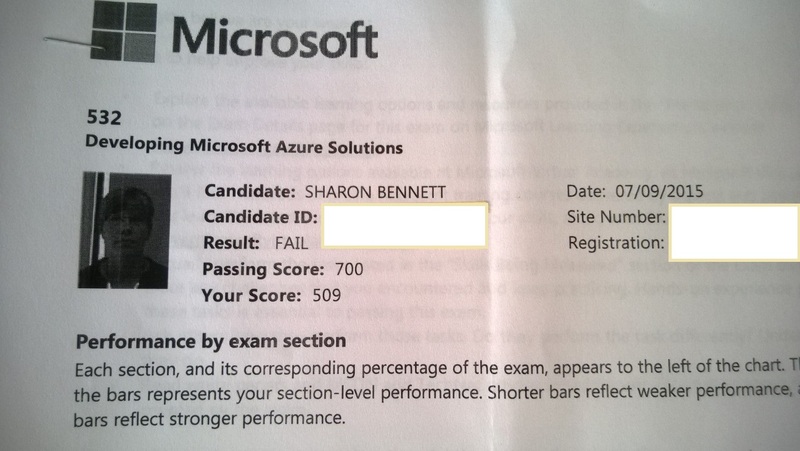 At Microsoft Ignite in May, it was announced that the 3 exams would make up a new MCSD: Azure Solutions Architect and I decided to give 70-532 a shot. I studied, had all the “book” knowledge, some basic Azure PowerShell, and after a few weeks of studying I figured it was time to take the exam. How hard could it be? After all, I have written 19 Microsoft exams and a number of other industry certifications. I have the studying procedure down to a fine art…or at least I thought I did. Exam 70-532 was an education. This was not an exam that I could just study for, and my mark proved that. In this case, failure was my only option and I knew that about 30 minutes in. As someone who comes from an infrastructure background with little to no dev experience, I should have spent more time with the hands-on studying. The exam was like being in a foreign country and only being able to understand snippets of the language. Was it a learning experience? Absolutely! Failure indicates where you are weak and where you need to improve. This does not only apply to exams, but to most of what we do. As a parent, I need to set a good example and show my kids that we all fail and more importantly it’s OK to fail. I also need to show them that we need to learn from our failures. Whether that may be studying better for a test, improving on a skill, or testing our comfort zone, failing makes us stronger. It gives us the drive to try harder next time. Without our failures we would not grow. And without growing, we would all become very stagnant very quickly. If you have been putting something off because you are scared of failing, ask yourself “What’s the worse that could happen?” You fail and you learn and you grow…how bad is that?